Pours with a small head that clings to the glass. Smell features the hops and the grapefruit flavor that they deliver. The taste is all about the grapefruit again, with pine flavor in there too. The malt adds a little balance but doesn't add much in terms of flavor. If you're expecting a beer with orange and lemon flavors, this certainly won't bring that, and the name "Citra Dog" seems a bit misleading. However, the strong grapefruit flavor is nice if you're into that (I'm ambivalent). The mouthfeel is thin for an IPA and the beer goes down very easily for it being a fairly potent brew. Overall, this is a nice brew. The suggested temperature is 37 degrees, and I drank it at around that temperature, but I wonder if there might be more complexity when it warms up a bit. This was terrible. Bottom of bottle may have shown a Julian date: 4130, which I'm afraid indicates it's a year old. Cloudy orange, frothy foam, looks nice enough. Smell is all gross wet grains, silage, moldy bread. Taste is sweet then bitter. Caramel malt and dandelion green bitterness. Bleh. Medium bodied, average carbonation. Nothing special, would have to try a fresh sample to re-rate. 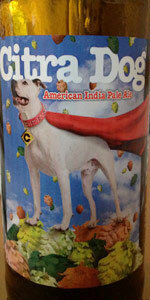 Citra Dog | Thirsty Dog Brewing Company. Poured from the bottle into a pint glass, this beer's head is two fingers thick and off-white, with web-like lacing, and a clear straw gold/amber body. Tastes like a very well-executed balance of the components described above with an overall hop oil bitterness that is trying its best to linger on the tongue, but it goes away after about 2-3 more breaths that help ventilate the palate. The mouthfeel I'm getting with this brew is light and very crisp. Mild carbonation as well. Overall, I'll rate Citra Dog | Thirsty Dog Brewing Company with a 4.5. As most other BA's have noted, including myself in the "smell" discipline of the review, this could use a fair amount of extra Citra hops to really and truly live up to our expectations as beer geeks. Besides that little qualm, its a very drinkable IPA. This beer pours a slightly hazy bright golden color with a 1 finger fluffy white head. Retention is minimal, but lacing is excellent. The aroma is where this beer really shines. Huge amounts of citrus fruits, most notably tangerine, orange and grapefruit bursts out of the glass. The taste is similar, very citrus forward, but the malt and bitterness on the back end kind if muddle it up. Feel is light and crisp, good carbonation. Overall a very tasty beer, but could be better. Also note that citra hops are far and away my favorite, so my rating may be a little skewed. 12 oz. bottle poured into a tulip glass. L---Golden/amber. Clear with a white head that faded fast and left some lacing. T---Fruity & full of citrus. Grapefruit and orange again. F---quenching and clean. Not as much carbonation as I would have liked. O---A pretty good IPA. Not a top of the line one, but I'd certainly have another.